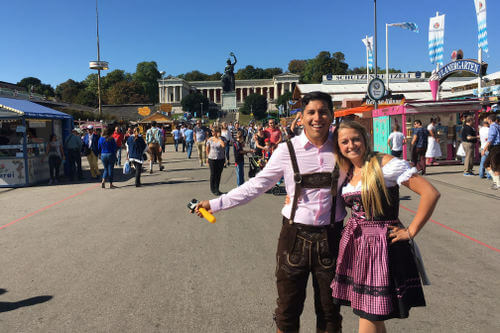 Last week we spent 3 awesome days in the bavarian capital Munich. We stayed at the Angelo by Vienna House Munich Westpark and we can highly recommend this beautiful 4 star hotel to everybody! It is the perfect hotel for business and city travelers, located in the heart of the city, super close to the most amazing landmarks. You can reach every landmark by train within a couple of minutes. The closest train station called “Harras” is about 3 minutes walking distance from the hotel, which was perfect. The Angelo by Vienna House Munich Westpark was opened in 2013 and combines bavarian hospitality with a modern design. We had such a good time and we can’t wait to come back soon. On our arrival day a really nice welcome package was waiting for us in our hotel room. Thanks again for these awesome gifts! 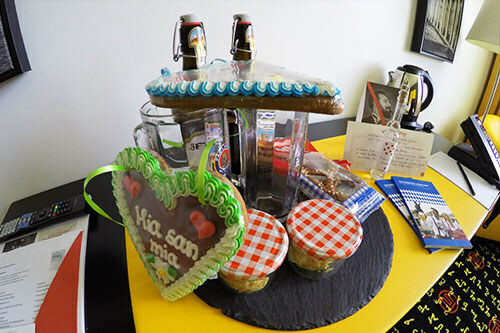 We were spoiled with german prezels with homemade Obazda cheese and beers. We also got the sweet Lebkuchenherzen (gingerbread hearts) as well as two little books “Oktoberfest Know How” in englisch and german. The hotel rooms are very cozy and designed very nice. 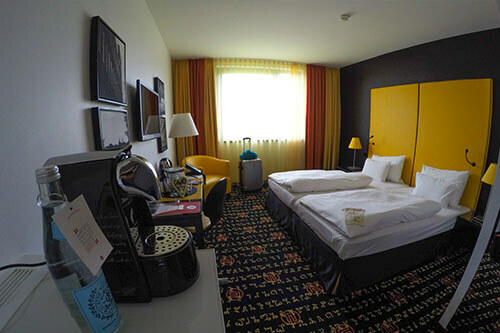 We loved the colorful yellow furniture of the room, whichs makes a warm and good atmosphere! 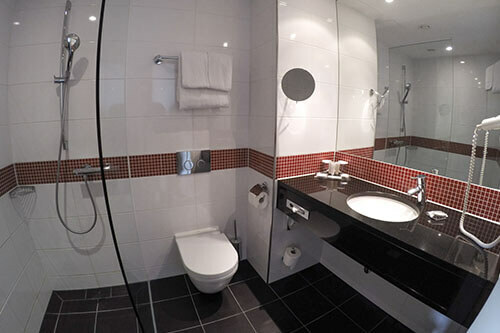 The bathroom was perfectly clean and everything seems to be pretty new and modern! The breakfast buffet is for sure one of the best we have ever had! We really love the german cuisine and the huge variety of food, which the Angelo by Vienna House Munich Westpark offered was incredible. We started the day with a traditional “Weißwurst-Früstück” (Bavarian veal sausage), which is very common in Munich. You eat this delicious sausages with sweet mustard and german prezels and it was so delicious. 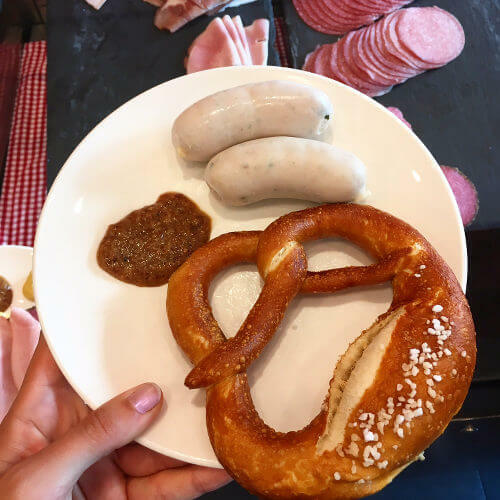 These sausages tast even better when you eat them in Munich! They offered a lot of other german specialties like Obazda (a traditional homemade cheese) or liverwurst. But besides the german style food, they had everything else you could wish for too: cereals, fruits, joghurt, cheese, meat, eggs in different stlyes, croissants, different bread, etc. Everything we tried was fresh and really delicious! I wish we could have breakfasts like this every day! 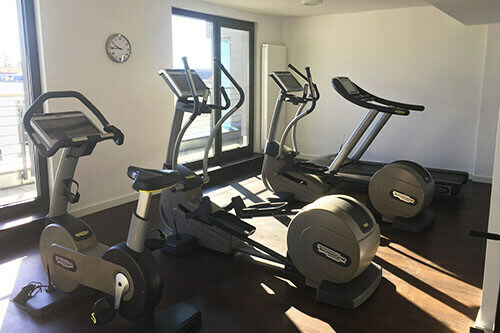 The Angelo by Vienna House Munich Westend provides access to their own gym and a sauna as well, which is great if you want to relax after a long sightseeing day. Unfortunately we did not use these facilities, but we will next time for sure!